Because I am an avid reader of LACMA’s Unframed blog, I knew that LACMA was having a two-day only viewing of it’s brand-spanking-new building the Resnick Pavilion. Of course I made sure to get my self over to LACMA to see the building, I’ve been eager anticipating its completion since I attended the press conference announcing the museum’s Transformation Phase II. 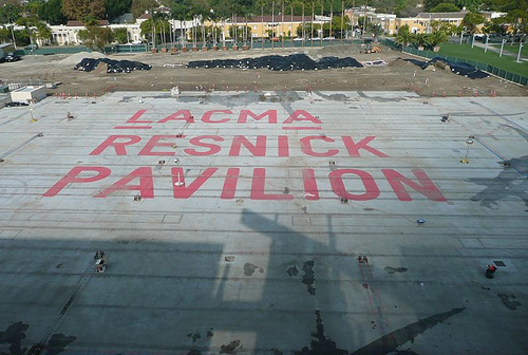 The day of the press conference all that was at the site of the planned building was a huge slab of concrete with red painted words announcing the Resnick Pavilion. Yes, of course it’s in the Baldessari-designed LACMA font. Well it turns out that LACMA had such great attention with its first preview, it decided to do another one-day-only viewing about a month later. I still feel special, but not as special. I especially wanted to see the building since I won’t be in LA when it opens in the beginning of October. The soon-to-be-finished building is, like its neighbor BCAM, designed by Renzo Piano. (The new building has affectionately been dubbed the Baby Piano). The Renzos face each other, both faced (oh word choice) in travertine marble, and mirror each other with their mostly glass facades. Both buildings also have signature accents of red. The BCAM has “the spider” escalator in glaring fire-truck-engine red, and the new Resnick Pavilion has huge HVAC units painted the same optimistic color. When will this red cease to be an accent color? 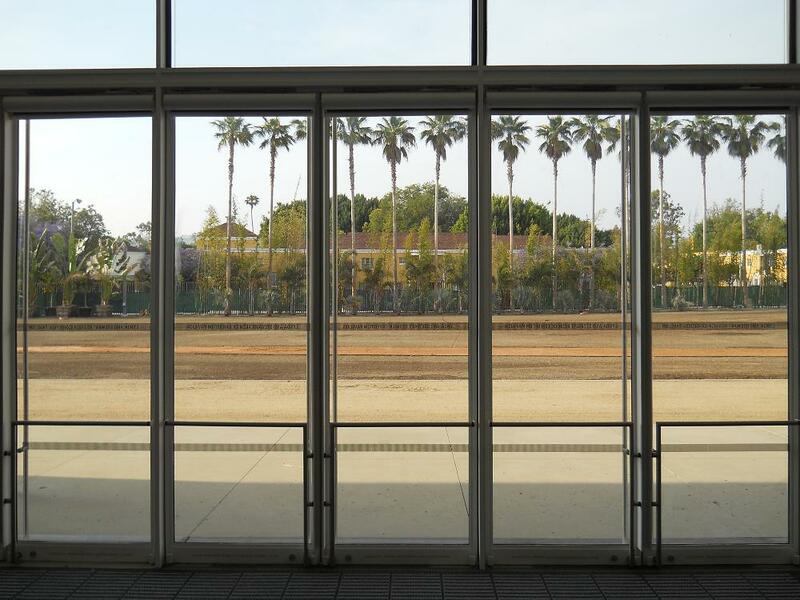 Surrounding the building is Robert Irwin’s Palm Garden, which has been an evolving project at LACMA. I am all for palm trees, and was sad when exploring Chicago earlier this summer to discover the palm does not flourish in climes where it tends to snow. Interior: The building may seem vapid, but that is because it was designed specifically for temporary exhibitions. The pavilion serves as a huge art warehouse, an acre of space with which the curator may do what with it he or she pleases. Think lots of temporary walls. The whole front of the building (the side that faces BCAM of course) is nearly a whole wall of floor-to-ceiling glass. 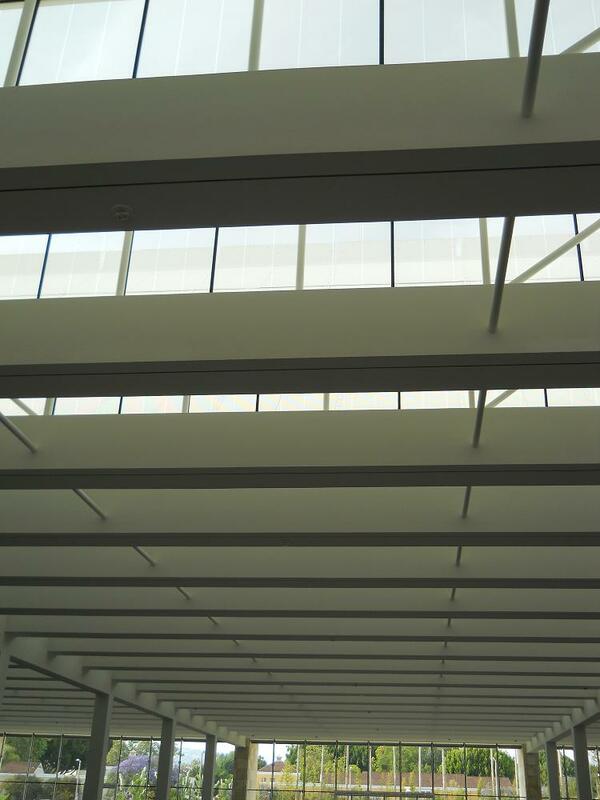 The use of natural light dominates the space; the Resnick Pavilion has the same saw-toothed roof that BCAM has, which allows plenty of natural sunlight to flood the interior. Term of the Day: "Sawtoothed"
The space is epically big. And of course Michael Govan wasn’t going to let the public sneak a peak at an empty building. 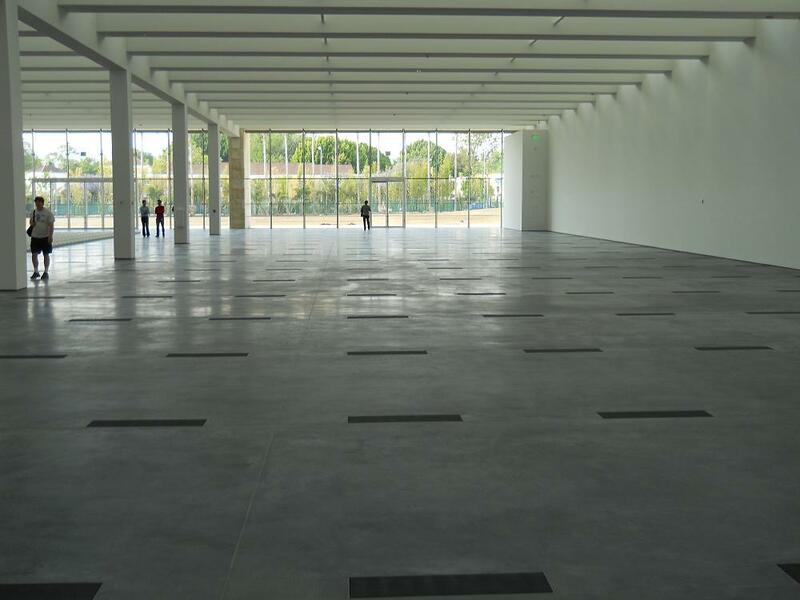 A temporary installation of Walter de Maria’s The 2000 Sculpture, had been laid out with loving devotion inside the pavilion. 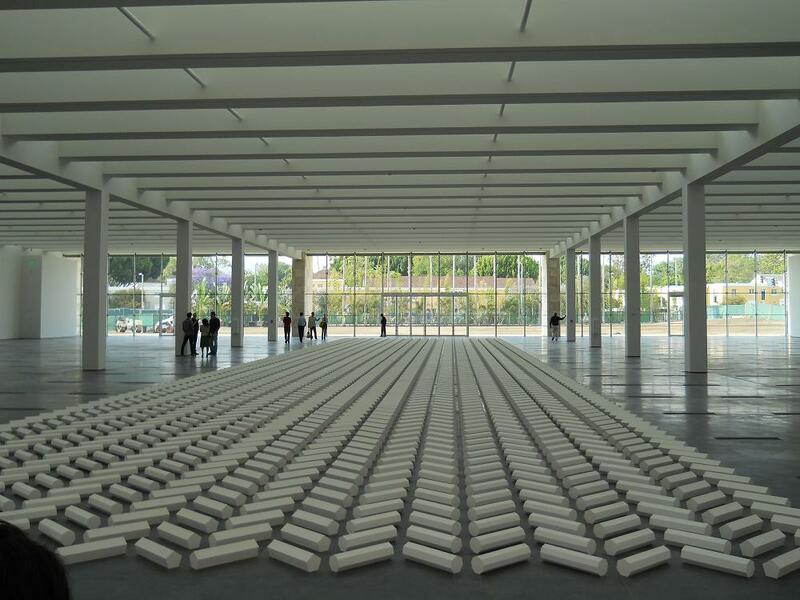 All 2000 polygonal plaster rods of it. The installation of de Maria’s work filled the entire central third of the building. There are two rows of support columns, which divide the interior into three long sections…Along the otter thirds of the space, one could see (what I think is the only problem with the building) rows and rows of vents. The vents are violently distracting in the otherwise uninterrupted flow of the building. Maybe the vents won’t be so distracting when exhibitions are installed. Here’s me thinking wishfully. Light streams in through the north end of the building as well. Another almost-entire glass wall looks out onto 6th avenue. It’s unclear where the planned land art piece, Levitated Mass, by Michael Heizer will be placed on the LACMA campus, but maybe it’s going to be somewhere out on that large patch of now, unremarkable dirt. Coming soon to a pavilion near BCAM! As mentioned before the leviathan of an interior is divided into three segments by the support columns. And what a coincidence! 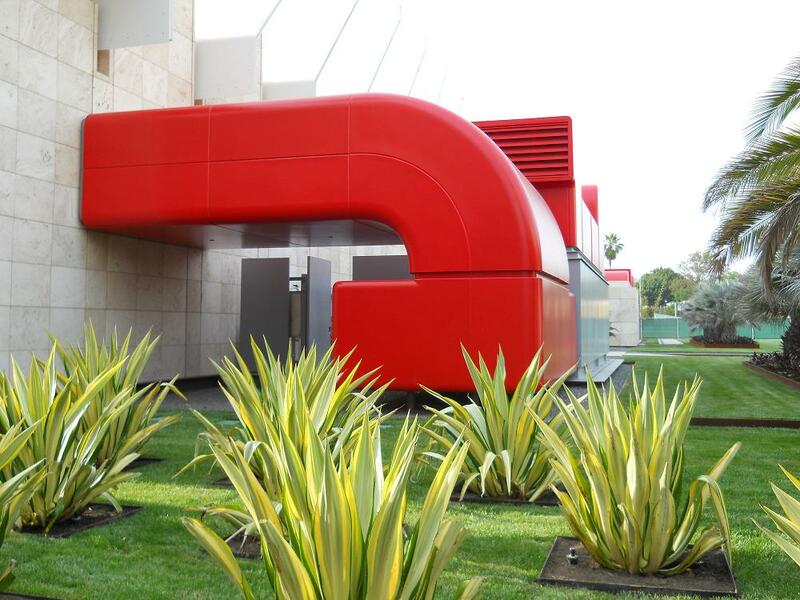 LACMA is planning not one, not two, but three! 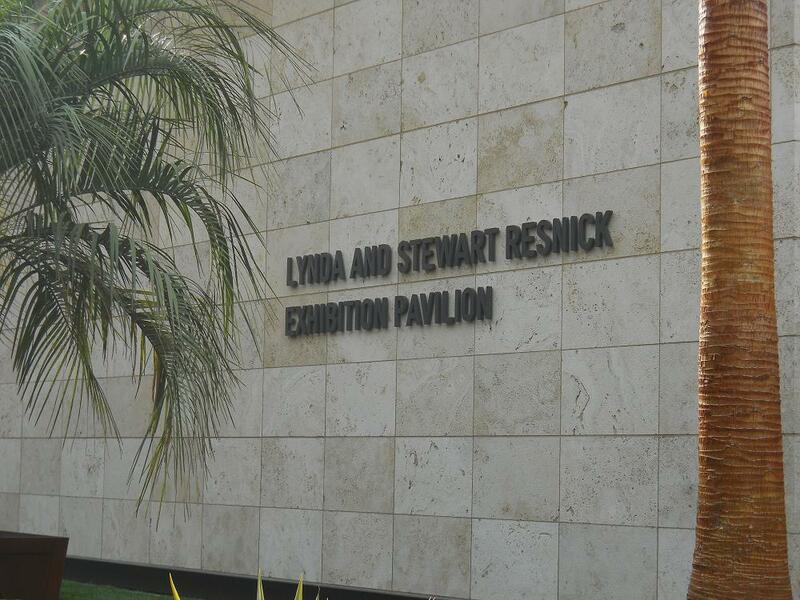 inaugural exhibitions for the Resnick Pavilion (again all opening the beginning of October). Words cannot describe how sad I am to be missing this opening. I’ve anxiously watched the progress of this building and hope to see the finished product when I visit LA in winter, hopefully before these shows close. Never forget to thank your donors. 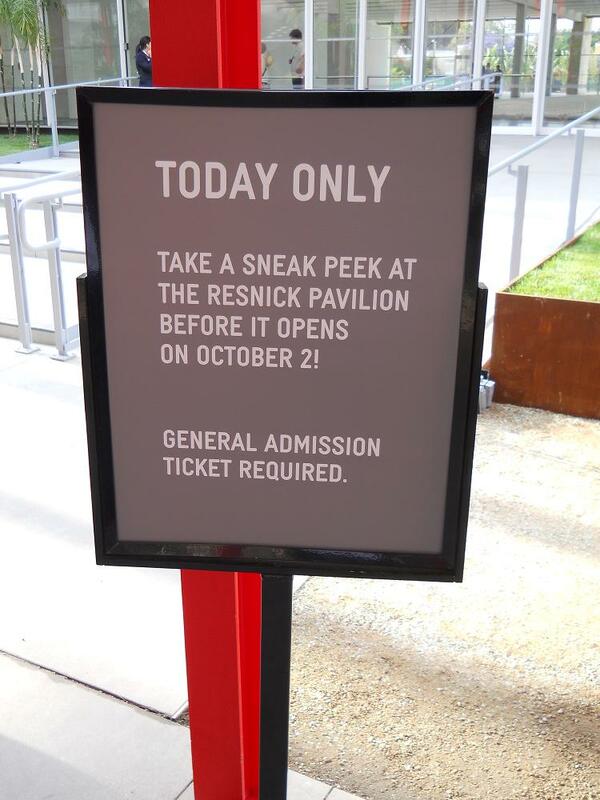 Interesting: when I visited the Resnick Pavilion on the preview day it seemed like a lot of people (most those of us slightly older of age) where having severe problems with the steps in front of the building. 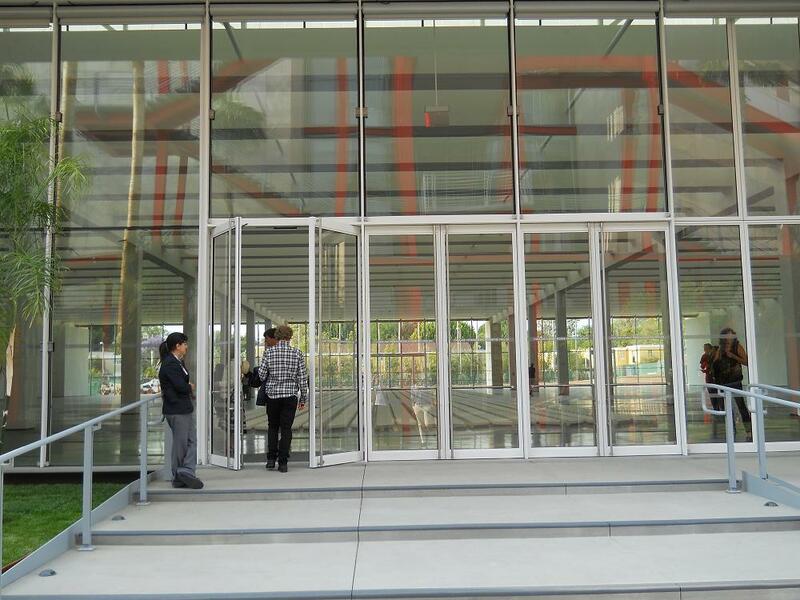 LACMA had station guards (visible in picture on the left) to warn people about the shallow steps, which as you exited the building were actually invisible. A more recent visit revealed that the life-threatening steps have been jackhammered away. My guess is that someone (probably important and probably white-of-hair) almost tripped and died and may of have said something. I actually have no evidence of this, so I’m not suggesting anything. Yay safety upgrades! Taking care of a lawsuit-waiting-to-happen. Related: Apparently there is a was being waged in LA betwixt LACMA and MOCA! See this um, interesting Vanity Fair article. The online version doesn’t have the fab! photograph of Lynda and Stewart Resnick (yes the people that paid for this building) lounging in their Beverly Hills abode. I’ll try and scan my copy, because this photo is priceless.